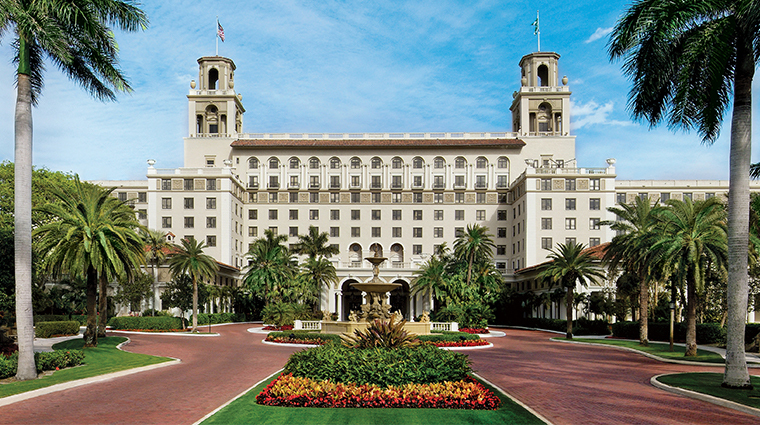 A celebrity favorite since 1896, and in its current building since 1926, The Breakers Palm Beach boasts a rich history rivaled only by its own penchant for constant reinvention. The result is a thoroughly modern and dynamic beachfront destination that happens to welcome you with a 200-foot, loggia-flanked, Murano-glass-dripping, vaulted main lobby based on a Renaissance castle in Genoa. It’s a testament to the service and amenities of The Breakers Palm Beach that such grand Italianate architecture — on 140 acres, no less — feels warm and welcoming. 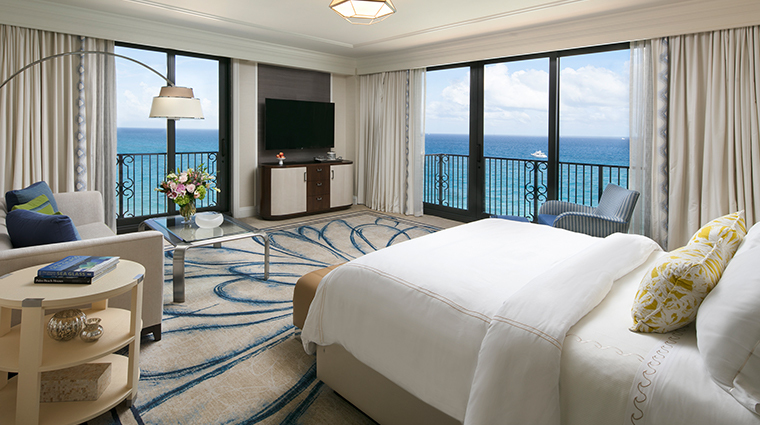 The property’s 540 guest rooms feature ocean-inspired décor, making your room feel like your home away from home. 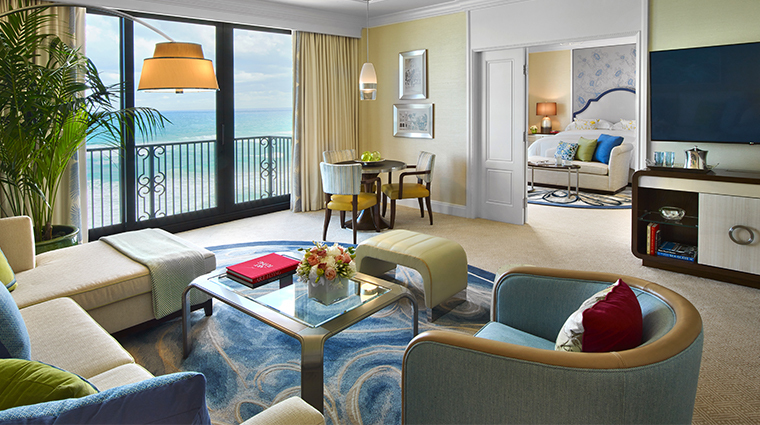 Book a stay on the 27-room Flagler Club Level and add such perks as a personal concierge, continental breakfast, afternoon tea, pre-dinner hors d’oeuvres and bar service, and after-dinner sweets — all enjoyed on a private terrace overlooking the resort’s palm-lined Main Drive. 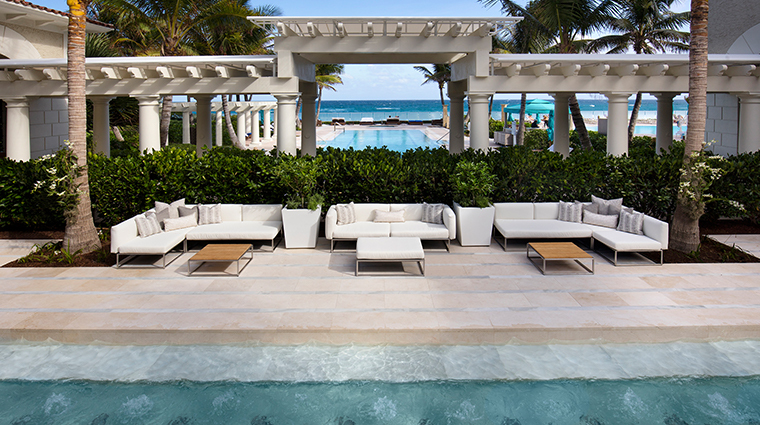 The Breakers Palm Beach has enough activities to keep you busy for weeks, beginning with a five-acre beachfront with fully equipped bungalows and four oceanfront pools. The historic Ocean Course recently debuted a fabulous face-lift. Led by famed golf course architect Rees Jones, the full-scale renovation improved playability without sacrificing the cherished character of these legendary greens. Other draws include two 18-hole championship golf courses, one of which was Florida’s first; 10 Har-Tru tennis courts; golf and tennis academies; and the 20,000-square-foot Spa at The Breakers Palm Beach. Eight restaurants, including the recently opened retro-chic lounge HMF and Flagler Steakhouse — both designed by hospitality visionary Adam Tihany — will satisfy any culinary craving you have, from freshly caught seafood to classic Palm Beach cocktail-party fare with flair. There’s also a collection of shops that includes Lilly Pulitzer and Guerlain as well as the unique Mix and Match at The Breakers for jewelry and shoes. The resort sits on 140 acres, divided into different campuses spanning the property’s extensive acreage. The golf and tennis clubhouse, along with Flagler Steakhouse, is located just across South County Road. Echo, a sleek Asian-fusion hot spot, is a three-minute drive away on Sunrise Avenue. And The Breakers Rees Jones Course is 10 miles away across the Intracoastal Waterway in West Palm Beach. The Spa at The Breakers, Palm Beach is top-notch, with an array of services to choose from and the occasional package or special. It's located near the main pool, and spa guests can wander in and out as they wish. Family activities include bicycle tours of historic Palm Beach; and a Coconut Crew day camp for children. The aptly named Italian Restaurant, located next to the Family Entertainment Center, is a casual option for families (though no one will blame you if you drop the kids at the center, least of all the children — they’ll be too busy admiring the movie theater, Xbox and PlayStation). Rooms feature modern décor with a seaside theme, such as curtains with coral reefs printed on them and the use of blue and green hues. 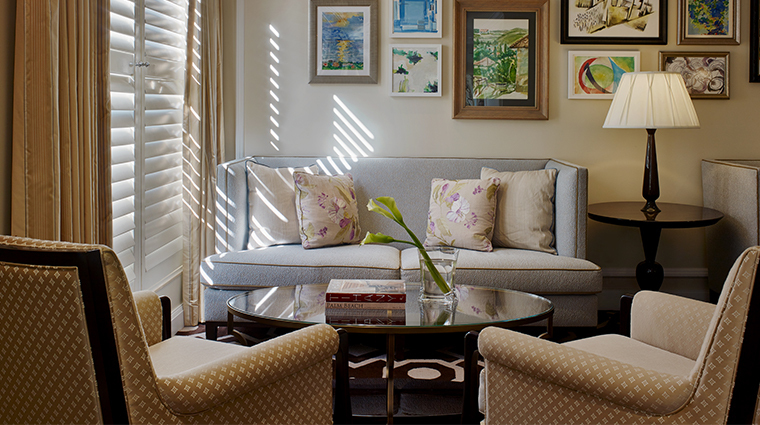 Other décor elements include eight-inch crown moldings as well as black-and-white framed photos of The Breakers. Even the flush-mount lights have a coral reef-like covering and there are rattan furniture pieces to firm up the beach theme. You’ll have a Sony radio/alarm clock with an iPod dock/charger and, in the bathroom, a small television built into the mirror. Each room has one or two flat-screen televisions in the main guest room, as well as Wi-Fi and useful items like a serving tray, two luggage racks, an ironing board, an iron, a safe and a recycling bag. 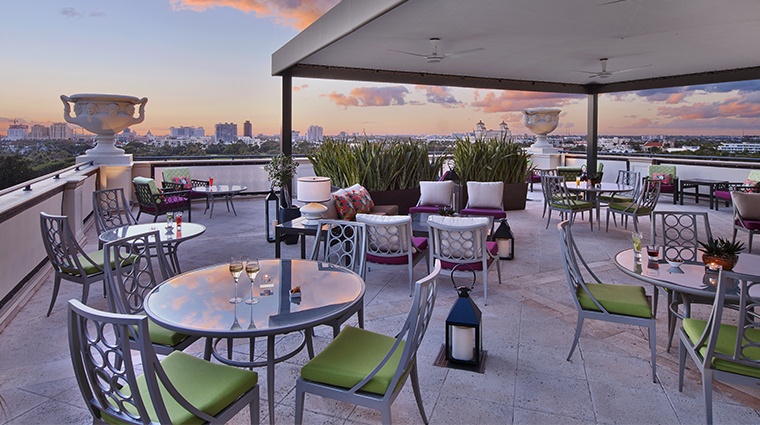 The finishing Floridian touch at this Forbes Travel Guide Four-Star hotel? Two hardcover coffee table books: Historic Photos of Palm Beach County and Florida Landscape. HMF is The Breakers’ newest restaurant. A 70-item menu focuses on shared plates (with extra-long utensils to prove it) divided into sections such as “hearth and robata” (order the Margherita pizzette) and “food truck” (items include Korean short ribs and SoCal fish tacos). 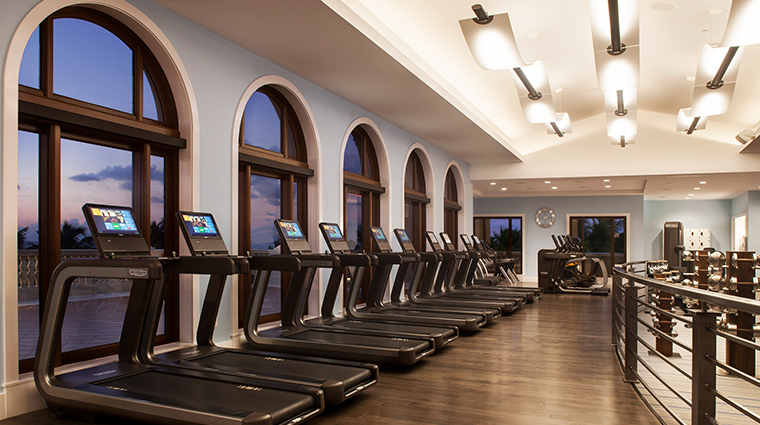 Flagler Steakhouse, which, as of November 2013, also sports a bold Tihany design, is located across the street from the beachfront hotel’s main building at the Ocean Clubhouse overlooking the Ocean Course. The vibe here is classic steakhouse with a modern twist. The luxury hotel has two beachfront, poolside eateries. The Beach Club, which has a Mediterranean feel and is a bit dressier than The Ocean Grill, serves breakfast and lunch. The Ocean Grill serves lunch only, from 11 a.m. to 6 p.m., and has the perfect patio for outdoor dining. Walk through HMF to find The Circle, The Breakers’ opulent, frescoed circular dining room that serves hearty breakfasts daily and a lavish Sunday brunch. The fresh-squeezed orange juice and tropical fruits are among the best we’ve had, and specialties like the mango-white-chocolate-chip pancakes are worth the indulgence.